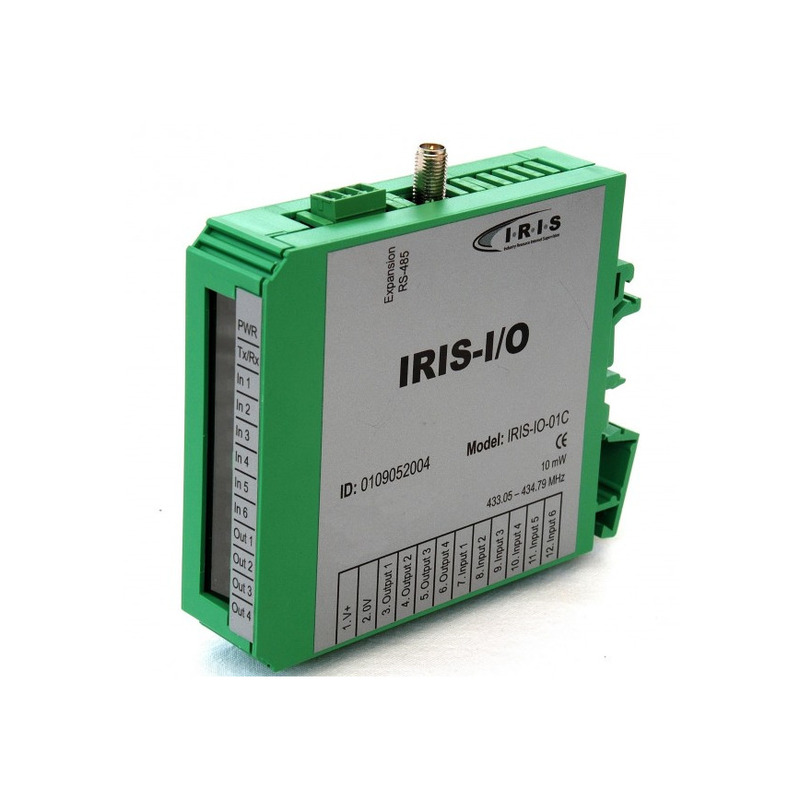 Our IRIS I/O module is an industrial radio module for the monitoring and control of machines. The IRIS-I/O data radio modules provide bidirectional radio communication and have a reach of up to 1,000 m.
They work on the 433 MHz band at a bit rate of 4,800 bits/s, and are designed for medium data volumes. They therefore provide a cost-efficient solution for many applications. IRIS provides particular time and cost benefits when a larger number of machines or sensors are widely spread and are to be triggered centrally. The I/O modules can be individually configured and thus ideally adapted to the respective circumstances, and are mounted to the C/F rail in the switch cabinet. The IRIS I/O module can be applied in a variety of ways in industry and house technology. The module is used, for example, for gate control through to communication between machines (M2M). For house technology, for instance, gates or air-condition units can be monitored and triggered centrally, and power and water metres read remotely. The I/O module can send malfunction messages and current measuring data automatically. Via the IRIS network, messages can be sent automatically via SMS or email to the respective staff responsible. Settings can be conveyed in the other direction via the IRIS network, and are implemented by the I/O module for machine control. The IRIS I/O renders special applications possible in the logistic processing of stocks and automated transport systems. IRIS radio modules are also used in the vending business to provide remote assessment of the filling levels and other messages from vending machines. Mobile components of transport systems or containers are monitored and triggered in the logistics field.